Maryland is located in the Mid-Atlantic region of the east coast of the United States. The state borders with Washington, D.C., Virginia, Pennsylvania, Delaware and West Virginia. The Chesapeake Bay, the largest estuary in the United States, stretches across the state and the Maryland Eastern Shore runs along the Atlantic Ocean. Maryland is a diverse state with urban communities in Baltimore and the Washington, D.C. suburbs. The state also has a lot of farmland and rural areas. The Appalachian Mountains cross the western side of the state, continuing on into Pennsylvania. As one of the original 13 colonies, Maryland played an important role in American history. The state played a pivotal role during the Civil War as its northern border with Pennsylvania is the famous Mason Dixon Line. The line was originally drawn to resolve a border dispute between Maryland, Pennsylvania, and Delaware in the 1760s, but during the Civil War, it represented the "cultural boundary" between the North and the South, after Pennsylvania abolished slavery. The mid-portion of Maryland, originally part of Montgomery and Prince George's counties, was ceded to the federal government in 1790 to form the District of Columbia. 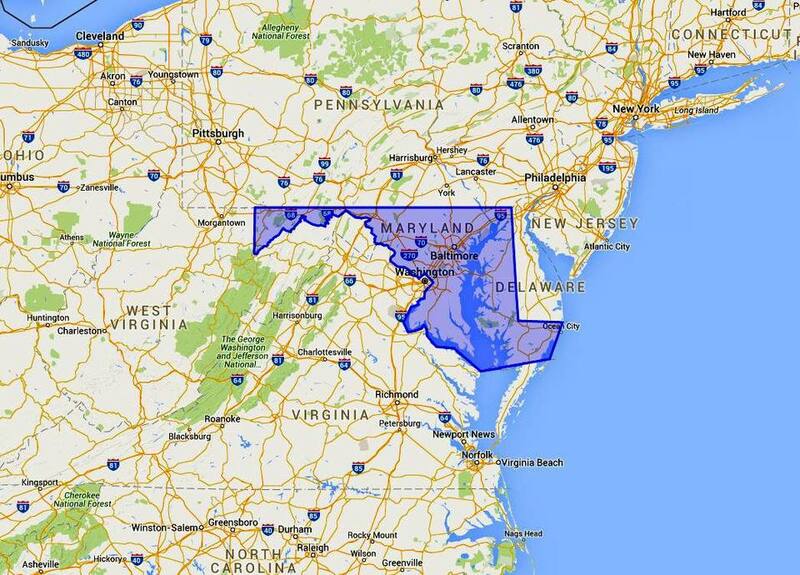 Maryland is one of the smallest states in the U.S. with an area of 12,406.68 square miles. The state’s topography is very diverse ranging from sandy dunes in the east, to low marshlands with an abundance of wildlife near the Chesapeake Bay, to gently rolling hills in the Piedmont Region, and forested mountains in the mountains to the west. Maryland has two climates, due to variances in elevation and proximity to water. The eastern side of the state, near the Atlantic coast, has a humid subtropical climate influenced by the Chesapeake Bay and the Atlantic Ocean, while the western side of the state with its higher elevations has a continental climate with cooler temperatures. The central parts of the state waiver with weather in between. For more information, see a guide to Washington DC Weather - Monthly Average Temperatures. Most of the state's waterways are part of the Chesapeake Bay watershed. The highest point in Maryland is Hoye Crest on Backbone Mountain, in the southwest corner of Garrett County, with an elevation of 3,360 feet. There are no natural lakes in the state but there are numerous man-made lakes, the largest of these is Deep Creek Lake. Maryland's plant life is as diverse as its geography. The Wye Oak, a type of white oak, is the state tree. It can grow in excess of 70 feet tall. Middle Atlantic coastal forests of oak, hickory and pine trees grow around the Chesapeake Bay and on the Delmarva Peninsula. A mixture of Northeastern coastal forests and Southeastern mixed forests cover the central part of the state. The Appalachian Mountains of western Maryland are home to mixed forests of chestnut, walnut, hickory, oak, maple and pine trees. Maryland's state flower, the black-eyed susan, grows in abundance in wild flower groups throughout the state. Maryland is an ecologically diverse state that supports a wide variety of wildlife species. There is an overpopulation of white tailed deer. Mammals can be found including black bears, foxes, coyote, raccoons, and otters. 435 species of birds have been reported from Maryland. The Chesapeake Bay is especially known for its blue crabs, and oysters. The Bay is also home to more than 350 species of fish including the Atlantic menhaden and American eel. There is a population of rare wild horses found on Assateague Island.